Welcome to Part II of our South by Southwest coverage, where our tireless concert goer braves five straight days of live rock ‘n roll. First we tackled the headliners. Here, it’s showcase time. Official SXSW showcases took place each night, in six hourly slots from 8 pm to 1 am. So much music, so little time, so many choices. Here’s some of the highlights. Wednesday night featured an 8 pm set from Tristen at The Phoenix. The Nashville singer/songwriter/guitarist deals out an infectious brand of pop rock with a rootsy base and strong melodic hooks. She’s got a great voice that at times recalls Jenny Lewis from Rilo Kiley. But “The Ringer” had more of a retro pop vibe a la She and Him, while “New Punching Bag” had a gloriously bouncy guitar shimmer. One of the most unique aspects/perks of SXSW is the potential to discover a great new band you’ve never heard of when your ear just happens to catch a compelling sound from the street. So it was after Tristen’s set when a soaring voice from a nearby rooftop caught our ear. A quick scramble up the stairs at the Tap Room revealed Fifth Nation, out of Brooklyn. Singer/guitarist King Julia has a voice with some of the soul undertones of a Lauren Hill or Erykah Badu, but she puts it in more of a rock context. She and drummer/keyboardist Music Read are just a duo, but create a full sound. Just catching the last 10 minutes of the set revealed this pair as a talent to keep an eye on. Legendary underground hip-hop artist Immortal Technique played to a packed house at the Mohawk Patio at 11 pm. He certainly delivered a high-energy set, although it seemed a bit heavy on plain old anger and a bit short on the radical, left-wing political lyrics that he’s famous for, such as a tune about 9/11 being an inside job. His message would also probably come across stronger if he had a band instead of just a DJ and four hype men. We spent the whole evening at the ACL Live venue on Thursday, but Widespread Panic’s set was over around 12:30 am, so there was still one more showcase to be caught in the 1 am slot. The perfect aftershow party was not far away as Nico’s Gun out of Philadelphia threw down a raucous set at Annie’s West on Sixth Street. The funky rock quartet got the party going immediately as girls were dancing onstage during the first song! The band sustained that high energy level throughout their set, mixing some psychedelic qualities in with the funk to keep the Spreadheads dancing the whole time. It was tempting to try and catch the psychedelic rock of Austin’s own Black Angels in the midnight hour, but the Cedar Street Courtyard was a total crowd scene as Jeff Spicoli would say, so it became more appealing to check out Toubab Krewe at Copa. The Asheville jamband drew a festive audience and delivered the goods with some uplifting melodic jams that had the Copa crowd moving and grooving. It was also tempting to catch Sharon Van Etten at the Central Presbyterian Church at 8:30 pm on Saturday, as her sweet voice would surely sound extra fine with those sensational acoustics. But the Bright Eyes set at Auditorium Shores was just too good to leave at that point. Afterward, it was over to the Belmont on West Sixth, a great little courtyard venue where Nico’s Gun were playing again. The funk quartet were worth seeing again, especially with the improved acoustics and great light show of the classy outdoor venue. It was another great set as the boys showed themselves as a band to watch on the jam rock and festival scene. There were lots of attractive options in the midnight hour with Austin power trio Ume (above) at Skinny’s Ballroom, as well as Texican rockers Los Lonely Boys at the Phoenix. But with the Band’s Robbie Robertson having recently tabbed Dawes to be his new backing band, catching them at Lustre Pearl seemed like the way to go. It didn’t take long to see why Robertson fell in love with the band; They’ve got a compelling vintage folk rock sound coming out of LA’s Laurel Canyon scene. They also have great chemistry, thanks to bassist Wylie Gelber, who was just flat-out amazing. His warm liquid bass runs showed a total mastery of the instrument and boosted every tune higher. When a lone member of a band continues to tour under the name that made him famous, it’s usually a sad sight. Infighting has led to acrimony, lawsuits and injunctions are filed, and worst of all, the last person standing, most likely the lead singer, is too proud to admit that maybe their songs and their singing or playing ability have just not held up well, and it’s time to pack it in. 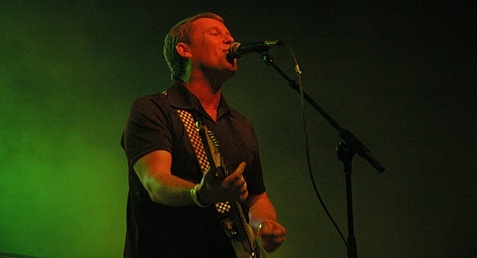 Wakeling is the leader of ska pop giants the English Beat, and rather than get into legal dust-ups with his former band mates, he and fellow singer Ranking Roger have worked out a deal where Wakeling tours as the Beat in the United States, while Roger, along with original Beat drummer Everett Morton, tours as the Beat in the band’s native England. Everybody makes money, everybody’s happy. How refreshing. Even better, Wakeling is not content to waltz into the sunset – the band he hired to round out the US version of the English beat are smoking hot, and the two-hour show they unleashed on the ecstatic audience at Skully’s Music Diner was a textbook lesson on how to do a so-called nostalgia show. We use that word ‘nostalgia’ reluctantly, but it must be said. Wakeling loathes the recording studio – his direct quote to us, when we interviewed Wakeling in 2009, was “I think the process of recording 12 songs in a row, at the same time, I used to find it interminably boring. I hated it. You know, you just listen to your own songs for three months, good God” – and hasn’t released anything new under any name since 1995. Not surprisingly, the evening’s set list contained the lion’s share of the Beat’s debut album, I Just Can’t Stop It, with a few songs from Special Beat Service and Wakeling’s spinoff band General Public mixed in (“Never You Done That” was a most welcome surprise), and by sticking with their best-known songs, Wakeling and crew had a mostly 40+ crowd dancing nonstop for two straight hours, which is no small feat. Wakeling’s between-song banter is lightning quick and often hilarious, and his band, anchored by terrific drummer Rhythmm Epkins, were super-tight, with several songs stretched well past their album running times. There are only eight dates left on the English Beat’s current US tour. If they’re playing in your town, or even within 50 miles of your town, go. The live show is sensational and the tickets are cheap, plus they still have the coolest t-shirts of any band alive. Forgive the decision to use first person for this one, but the editorial ‘we’ just doesn’t apply here. I am not one for acoustic shows. Whenever I see a guy with an acoustic guitar anymore, I want to pull a Bluto and smash it to bits. This from a guy who did an acoustic gig with his brother the weekend of his wedding. I blame Jack Johnson, really. That whole surfer/hippie scratcha scratcha scratcha thing just bores me. Long story short, when I saw that my beloved Trashcan Sinatras were coming to Dayton to play the Canal Street Tavern, I was in. When I saw it was an acoustic show, I was slightly less in. Boy, did they show me. Breaking the evening into two sets, and playing requests submitted in advance online by their fans, the Trashcans positively soared. The harmony vocals by the Douglas brothers (Jon on guitar, Stephen on drums) stood out much better in the acoustic setting, and the band shrewdly mixed in a few electric instruments to give the overall sound a little more thump. Smart move, that. The set list was divine, showcasing each of the band’s five albums relatively equally. From what my friends who saw them in Cleveland said, though, they’re shaking up the set list drastically each night, so you might hear six of the songs they played here. 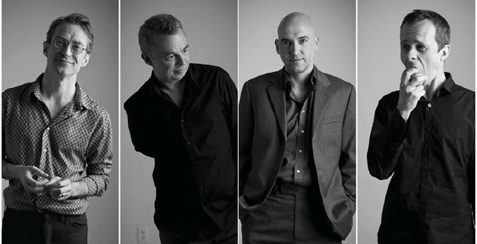 The main focus, of course, was on In the Music, the band’s newest album, from which they played six of the album’s 10 tracks. Guitarist Paul Livingston sat in the back on a chair, staring at his (electric) guitar as if there wasn’t anyone else in the room (think Johnny Greenwood, without the floppy hair), while drummer Stephen Douglas had the coolest “acoustic” drum setup you’ve ever seen. The kick drum was digital, just a pedal with a pre-amp that gave extra impact to the various shakers, bongos, triangles and snare hits (brushes, of course) that he mixed in. Also, he had a tambourine on his left foot. Very cute. You have to hand it to bands like the Trashcans. The new album isn’t selling because no one buys records anymore (though I saw them sell a few copies at the show), and the tickets were cheap ($12, holler), so they’re probably not making much on those. I hope they’re shifting a lot of merchandise – they were selling flash drives containing the evening’s performance shortly after the show – because it would be a shame to see a band like this pack it in due to financial constraints, especially when they have proven time and again that they still have so much to offer. There are only a few dates left on the tour, so if you live in any of the following cities, go. You shannae regret it.